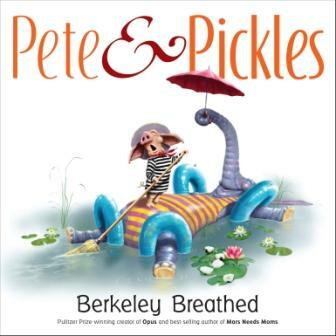 Pete is a “perfectly predictable… perfectly practical… and a perfectly uncomplicated pig.” A sad little widower, Pete’s life gets turned upside down by Pickles, an imaginative and adventuresome circus-escapee elephant. The two are so different in every way creating the age-old “opposites attract” conflict that makes for an exciting relationship and love story. Every page is filled with dramatic and fantastic imagery and the story moves along at a fast clip. Emotions flow across the pages faster than the flood that traps the two characters but all of them tinted with humor. Told by a master storyteller with words and images, Berkeley Breathed (creator of Opus and the comic Bloom County) easily pulls the strings on our emotions like a master puppeteer. The characters are so well described and lovable that we could probably relate them to people we know in our own lives. Mr. Breathed wrote an absolutely touching yet hilariously illustrated romance between a staid pig and a lively elephant. This is one exciting backyard adventure/love story not to be missed!